TAMPA, Fla. - Oct. 2, 2017 - PRLog -- The Pet Professional Guild (PPG) has celebrated the launch of its Shock-Free Coalition (www.shockfree.org) with a week of special events that included interviews with several canine behavior experts, a host of interactive social media activities, and culminated in the giveaway of 10 tickets to its annual educational summit, taking place in Orlando, Florida on November 16-20, 2017. The Shock-Free Coalition has received a warm response from pet owners and force-free pet professionals worldwide, with hundreds already signing the Shock-Free Pledge to show their support for the global advocacy campaign, which aims to end the use of electric shock in pet training, management, and care. Other major goals include building a movement dedicated to the elimination of shock devices from the supply and demand chain, and creating consumer transparency by helping pet owners become more aware of the differences between training methods and equipment, whether they are based on the most up-to-date scientific research that advocates for positive reinforcement and highlights the pitfalls of aversive methods, outdated and punitive based on pain and fear, or a mixture of the two. Educational and promotional activities during Shock-Free Coalition launch week included an "Ask the Expert" Facebook chat with well-known dog trainer and author, Jean Donaldson, and three special "Shock-Free" editions of the PPG World Service live podcast (www.petprofessionalguild.com/Videos-To-Share). Guests included best-selling author and ethologist, Dr. Marc Bekoff, Red Bank, New Jersey-based trainer, Drayton Michaels, who participated in an "Uncensored Chat about Training and Shock" with PPG president, Niki Tudge, and several Project Trade (www.projecttrade.org) ambassadors who actively participate in PPG's international advocacy program where pet owners swap aversive equipment for discounts on scientifically sound, force-free training services. Finally, at the end of the first week, to celebrate a successful launch and to further promote the Coalition's drive to create greater awareness of the pitfalls of using pain and fear in pet training and behavior modification, PPG hosted a live competition on its Facebook page where 10 free tickets to its annual educational summit were up for grabs. All enthusiastic participants had to do was be the first to correctly answer an event-based question – amidst stiff competition. The eventual winners of a summit ticket plus hotel accommodation were Jennifer Blackman, Jacqueline Drake, Marie Macher, Judy Luther and Kate Godfrey, while Jenn Stanley, Ursa Major, Mandy Burger, Elise McKenna Jones and Natalie Bridger Watson all won summit attendee tickets. "We are thrilled to offer free tickets to 10 lucky people and give them the incredible opportunity to attend our annual summit and learn more about animal behavior and up-to-date training methods from scientists and experts who are at the forefront of their field," said Niki Tudge, president and founder of PPG. "We are also delighted with the response to the rollout of the Shock-Free Coalition and its educational message. 'Positive relationship,' 'natural methods,' 'relationship building,' 'positive only,' and 'no food necessary' are all taglines regularly used by dog training organizations in their marketing literature and these expressions appeal to pet owners who may not always understand the various training methods available to them, and the fallout and unintended consequences of making the wrong choice. It is important not be fooled by the many deceptive marketing terms, which, for shock collars, include 'vibrating,' 'e-touch,' 'stimulation,' 'tingle,' and 'static.' The fact is that the primary reason shock collars are effective in stopping behavior is because they are painful, and it is time for pet professionals to stop inflicting pain and evoking fear under the guise of training, and take shock off the table once and for all. Rather, by focusing on education and advocacy to ensure a better-informed pet owner who seeks out humane alternatives, consumer demand will automatically be reduced, and real progress can be made in reaching the end goal of ending the use of shock devices in animal training and removing them from the marketplace altogether." The Pet Professional Guild (www.petprofessionalguild.com)is a 501(c)6 a member organization founded on the principles of force-free training and pet care. Its membership represents pet industry professionals who are committed to force-free training, pet care philosophies, practices and methods. Pet Professional Guild members understand force-free to mean that shock, pain, choke, fear, physical force, and/or compulsion-based methods are never employed to train or care for a pet. 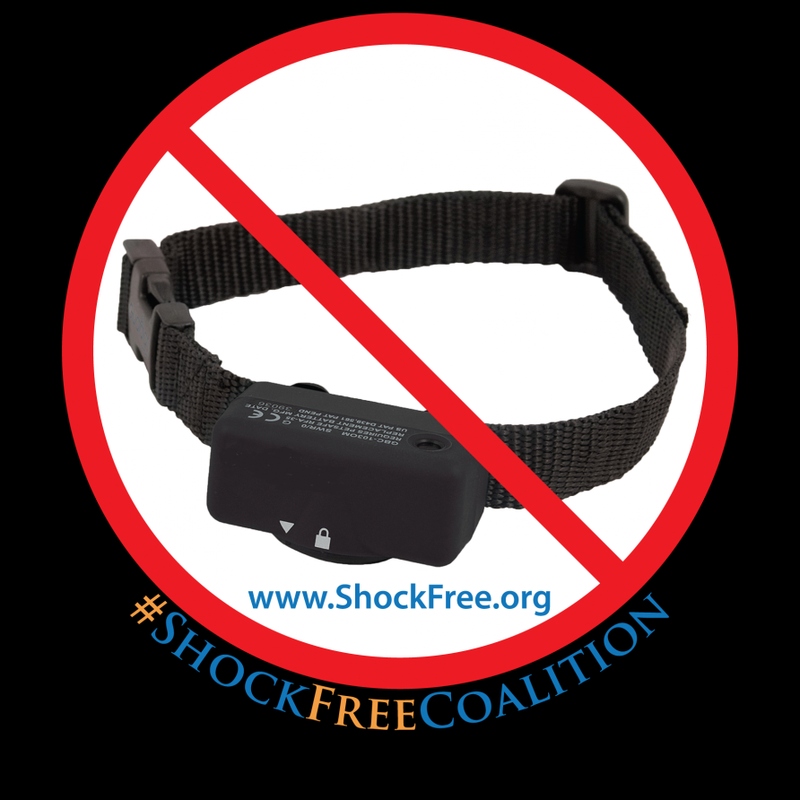 The key purpose of the Shock-Free Coalition (www.shockfree.org) is to build a strong and broad movement committed to eliminating shock devices from the supply and demand chain. This goal will be reached when shock tools and equipment are universally unavailable and not permitted for the training, management and care of pets.The Shock-Free Coalition believes that pets have an intrinsic right to be treated humanely, to have each of their individual needs met, and to live in a safe, enriched environment free from force, pain and fear. The initiative has been developed purposely to bring together parties that have mutual business interests and a personal investment in the welfare of pets and embraces stakeholders of similar values and interests, enabling all parties to combine their resources and become more successful in achieving the stated goals. Members of the Shock-Free Coalition consider it to be their responsibility and utmost obligation to be vigilant, to educate, to remain engaged and work toward eliminating shock as a permissible tool so it is never considered a viable option in the training, management and care of pets. Project Trade (www.projecttrade.org) is the Pet Professional Guild's international advocacy program that promotes the use of force-free pet training equipment by asking pet guardians to relinquish choke, prong and shock collars (and any other devices that are designed to change behavior through pain or fear). Project Trade is designed to give pet owners incentives to seek pet professionals who will exchange aversive training and pet care equipment for alternative, more appropriate tools and educational support at reduced cost. It is the Pet Professional Guild's position that effective humane animal training and pet care procedures lay the foundation for an animal's healthy socialization and training and helps prevent behavior problems. The Pet Professional Guild believes that the general pet-owning public deserves affordable access to transparent, competent and accountable pet behavior and care professionals, and that pets deserve to be cared for, managed and trained in a nurturing and stable environment.